Martha was named by Broadcast Magazine as a Broadcast Hot Shot in 2018. The Hot Shot list celebrates individuals under 30 making waves in TV and will this year see it publish it's first female-only list. 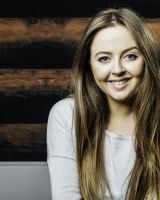 Martha joined InterTalent Rights Group (formally Cole Kitchenn) in 2016 as an Assistant Agent to Alex Segal, having studied Public Relations at The Chartered Institute of PR and specialises in talent management, branding and endorsements. Martha will be building her own select roster of clients from across the entertainment industry.